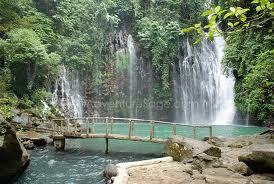 Maria Cristina Falls is a waterfall of the Agus River on the island of Mindanao. 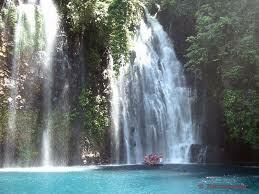 It is sometimes called the "twin falls" as the flow is separated by a rock at the brink of the waterfall. 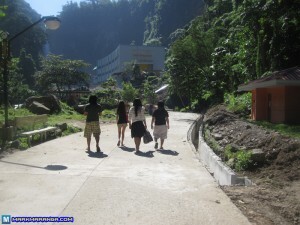 It is a landmark of Iligan City, nicknamed the City of Majestic Waterfalls, because of the presence of more than 20 waterfalls in the city. It is located 9.3 kilometers away southwest of the city proper at the boundaries of Barangays Maria Cristina, Ditucalan, and Buru-un. 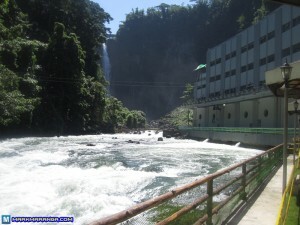 Well-known for its natural beauty and grandeur, the 320 - feet (98 meters) high waterfall is also the primary source of electric power for the city's industries, being harnessed by the Agus VI Hydroelectric Plant. Maria Cristina Falls powers the Agus VI Hydroelectric Plant, one of the several hydroelectric plants that harness Agus River. The power plant has a 200 MW potential capacity supplied by a water flow of about 130 cubic meters per second. Agus VI is operated by the National Power Corporation and was commissioned on May 31, 1953. Under President Gloria Macapagal-Arroyo's Mindanao Super Region development plan, the Agus VI is planned to undergo a 1.856-billion-peso upgrading project.